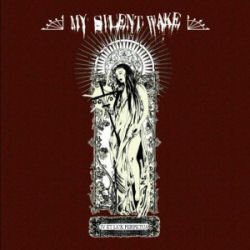 British band My Silent Wake must be one of the busiest bands on the planet. They were founded only in 2005, but IV Et Lux Perpetua is already their fourth longplayer, on which they combine in a very unconventional way elements of black, death and gothic metal in order to come out with something quite unique. The opener and title track starts the album on a very gloomy note and instantly mirrors the band’s fondness for avant-garde sounds. Just like many other tracks on the album, this song is totally unpredictable, and it’s this kind of acting which makes IV Et Lux Perpetua such a suspenseful affair. At times My Silent Wake remind me of the early Celtic Frost, although the parallels don’t work on every title. Death Becomes Us is for instance no less extreme, but its bass heavy black doom metal orientation sounds even more brutal. The CD’s highlight is the seven minute long Father, an atmospheric track that reminds somewhat of My Dying Bride and ends with a psychedelic part, surprising me once again of the band’s vast array of ideas. This calmer piece is followed by the much rawer Graven Years. The final track Journey’s End would even have made sense on a Hawkwind album. Some people might blame My Silent Wake for lacking a common thread, and while this may be true, it is also obvious that the band has given up its folklore tendencies in order to flesh out a new direction. It’s this quest for a new identity which makes the listening experience so rewarding, and I am sure that I will listen to IV Et Lux Perpetua many more time.